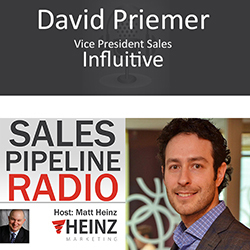 David Priemer is Vice President of Sales at Influititive. Psychology of sales - sales has evolved a lot ove rthe years. Vendors used to have all the information. The relationship between buyer and seller has fundamentally changed thanks to the Internet. Emotional intelligence and sales psychology has become tremendously important. Matt asked David what he recommended to sales managers, leaders and trainers about implementingand integrating a better sales psychology and sales practices. "Old ways are selling... we try our best pitches, we make calls..." This doesn't fly anymore. Time is too precious. Social Selling methodologies and tactics make the best use of everyone's time, including the target buyer.